I have two favorite kinds of picture books: those that I’ve read so many times that I’ve memorized them, and those that, on the first reading, I know are destined to become the first kind. The Wolf, The Duck, and the Mouse by Mac Barnett and Jon Klassen (Candlewick Press, October, 2017) is now well on its way to becoming the first kind. The first time I picked it up, I read it three times, and I didn’t even have a child nearby to encourage me. Since then, I’ve lost count of how many more time I’ve read it, and a number of other people have read it, too. It would have been easy enough to hide it under other books on my desk, but I’ve been enjoying this one’s magnetism. So what’s the appeal? I’ve been giving that question some thought. I have not written about books with a major illustration component since I was in third grade or so, and even those were “chapter books.” Picture books were for the younger set. They didn’t qualify for book report credit. It’s only now that I realize they should, especially if they have any of the depth and artistry and humor that this one has. The story of two smaller animals that were eaten by a big one, The Wolf, the Duck, and the Mouse can easily be compared to Aesop’s fables and Kipling’s Just-So Stories. Like Aesop, Mac Barnett and Jon Klassen spin a tale with classic forest-and-barnyard characters. Like Kipling, they answer a question akin to “Why does the rhinoceros have wrinkly skin?” But this book is hardly derivative. Instead, the author has echoed his predecessors only enough to provide a little atmosphere for his story. The illustrations reflect this subtle but clear tie with the classics, too. The palette and technique evoke the forests so common in old fairy tales, but the images are fresh and funny. And like all the best illustrations, they give the reader something new every time through. I first read The Wolf, the Duck, and the Mouse two weeks ago in my office in Las Vegas. I was delighted to learn that the author and illustrator will be launching the book in Las Vegas on October 10th at the Fifth Street School as part of this year’s Las Vegas Book Festival. Details here. One week ago today, Las Vegas was the scene of a horrific crime. The city, still reeling but also rallying to provide comfort and support to all those affected, has revealed a strength of community few outside southern Nevada knew about. That resilience, born of forging a city in a desert against great odds, is not a fleeting thing. It will carry us through, even though one question about last Sunday may well remain unanswered. We’ve seen pictures of the man who did this. We know where it happened, and we will never forget those interminable minutes when terror rained down on a music festival. But we may never know why. This unanswered question came to mind as I read The Wolf, the Duck, and the Mouse several times before writing this article. I was looking for detail to add to my review, and suddenly I was struck by the powerful message in the story. The wolf commits a wolf-like attack on a mouse, which should have been the end of the mouse. Instead, the mouse meets a duck in the belly of the beast. And in the end, it’s the duck and the mouse who prevail, and we find out why the wolf howls at the moon. Las Vegas was devoured by a wolf last week. Las Vegas will prevail. We may never know why a gunman wreaked such horror, but we will not be destroyed in the belly of the beast. We may have been swallowed, but we have no intention of being eaten. 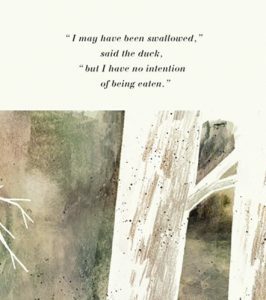 The Wolf, the Duck, and the Mouse joins my third favorite kind of picture book, the kind that not only delights with art and wit, but also — without being the slightest bit heavy-handed or didactic — delivers a truly wonderful message.